A sign outside the storage until facility near my home reads: ‘If you can’t find your lawnmower, bring your garage clutter here!’ In a world where we too often fall into the trap of over consumption, we are being encouraged to ignore our excess by simply relocating it. 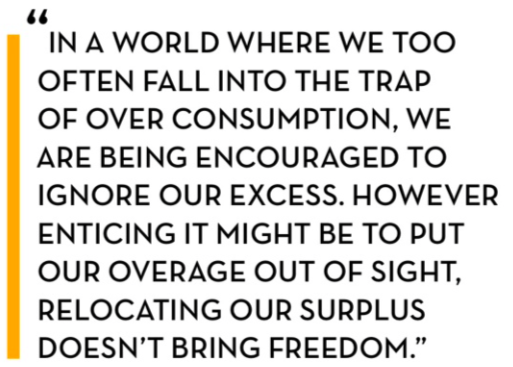 However enticing it might be to put our overage out of sight, relocating our surplus doesn’t bring freedom. Over the last 13 years, working as a professional organizer, I have had a front row seat to thousands of people’s relationships to stuff. At times I have literally been up to my waist in people’s possessions! I can tell you, from first-hand experience, that the acquisition of more and more stuff only leads to unhappiness and stress. How did we get here? We have become a culture of collectors. Our society, particularly in the United States, encourages accumulation. We are continually told, through advertising and social norms, to get the latest gadget, the replacement appliance, and the upgraded versions of our toys. Without a clear definition of what ‘enough’ is, we don’t know when to stop. It is difficult to identify when ‘enough is enough,’ so we just keep adding to the pile. We’re told we deserve a break, a treat, a reward. We may be looking for relief or reprieve from the stresses in our lives. This can lead to us going about life with a mindset focused on what we feel we need, rather than what we can give. When we create habits of focusing on what we need and want, we no longer are thinking about how we can build, create, and contribute to those around us. 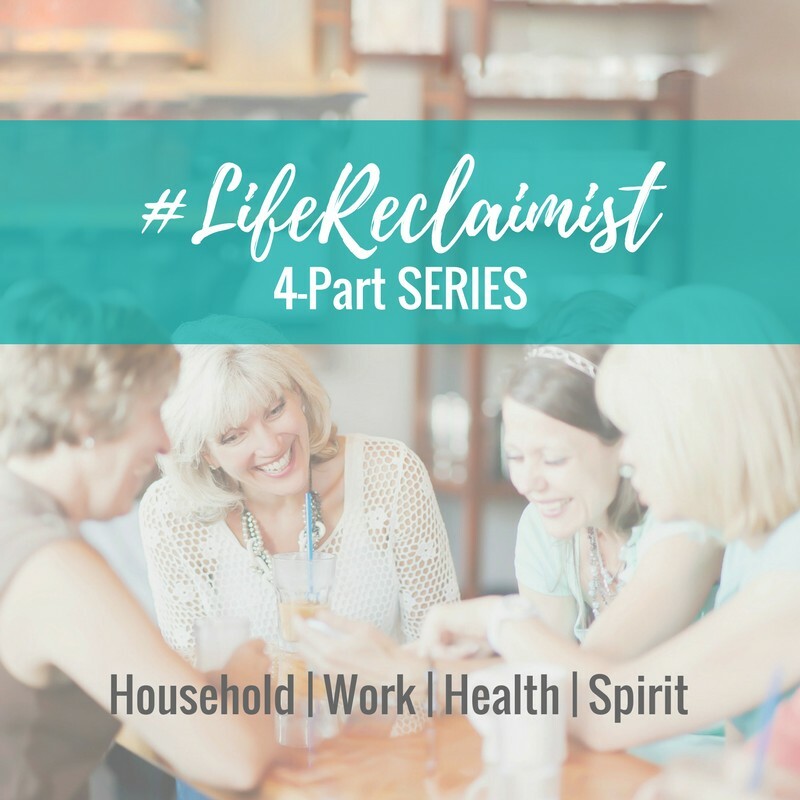 The vicious irony is that once we have accumulated all the things we think we need, our possessions can actually begin to negatively affect our lives: becoming overwhelming and hindering the way we actually want to live. Whatever we collect we must save, dust, store, protect, inventory, and insure. Having stuff the we need and love isn’t wrong, however, when we have too much it can negatively affect our lives. When we stop stewarding, using, and appreciating what we own, then our possessions are no longer a tool for better living, they are an obstruction. 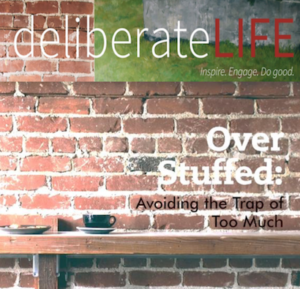 There’s really no need to live life stuffed. If we engage with life realizing we are already complete, we won’t feel compelled to spend ourselves trying to become full. Adapted from: Reclaim Your Life and Get Organized for Good™ copyright© 2007 by Vicki Norris (available now at www.RestoringOrder.com). Published by Harvest House Publishers, Eugene, OR. Used by permission.